You might be asking yourself, less stripes? No, not the colorful stripes on your breadbin badge. We’re talking about the stripes on the video image. The same stripes that we’ve all become accustomed to over the many years of playing Commodore 64 games, watching demos and carrying on with modems and BBS’s. These stripes, which are actually interference, come in a variety of flavors: horizontal, vertical, and checkerboard patterns. The intensity of the stripes also varies from machine to machine. 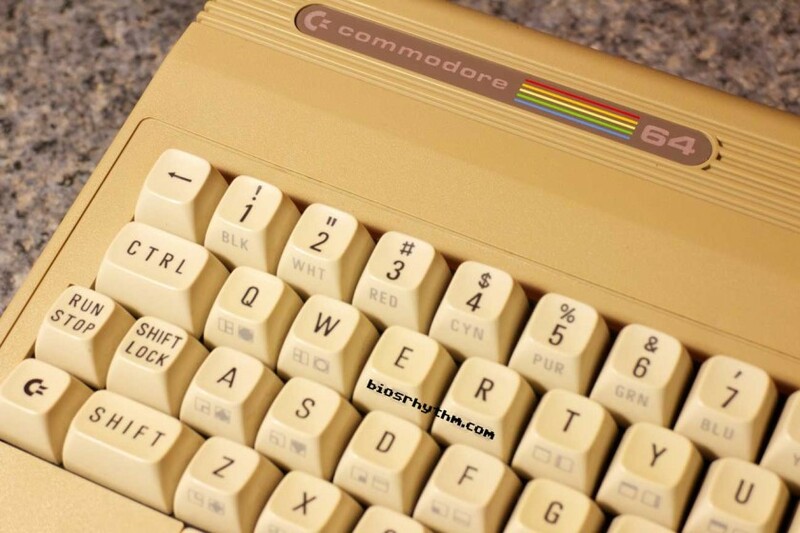 Some say with that these stripes become even more apparent when using a C64 with a modern LCD monitor. Whether you love them or hate them, there is a solution for easing or even completely eliminating the stripes all together. The user e5frog on lemon64.com came up with a design for a carrier PCB that would sit between the VIC-II and the motherboard. It’s purpose was to invert certain signals back into itself, each with an adjustable degree. These signals AEC, PHI0 and chroma are all thought to contribute to the stripes on the final output image of the C64. It’s a fascinating discussion that I urge you to read. 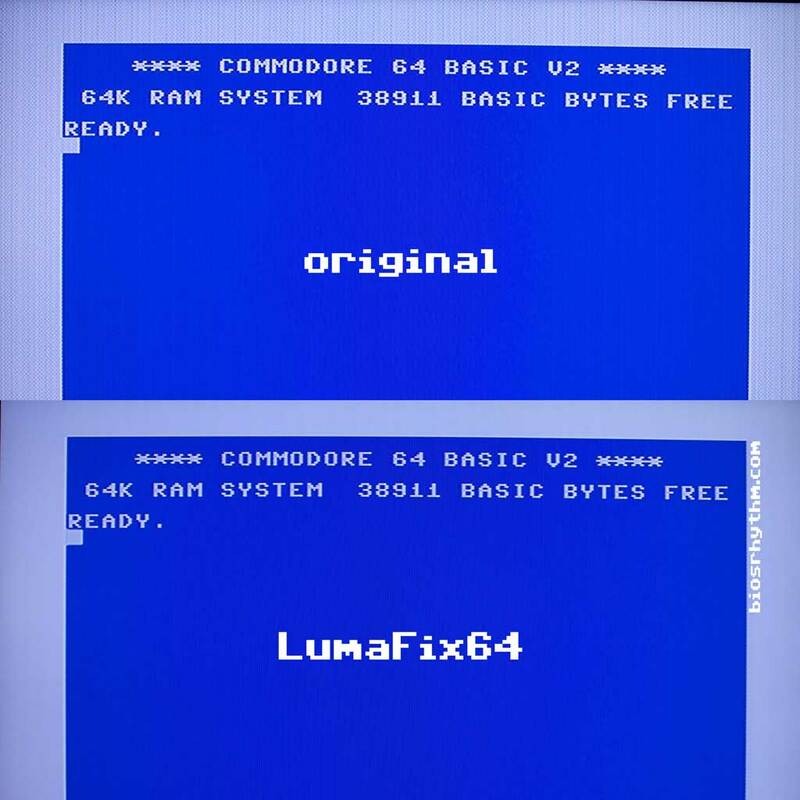 A LumaFix64 with manual and installed inside a C64 with a short board. The board is available from a variety of places, built or bare and costs between $15-$30 shipped. To test, I picked a C64 from my collection that exhibited the most stripes. It’s a PAL German C64 with a short board and a white keyboard. It’s basically a C64c inside a breadbin. For comparison, I wanted to make sure the pictures were taken the same. The camera was locked to a tripod, set to manual exposure, manual white balance and manual focus. 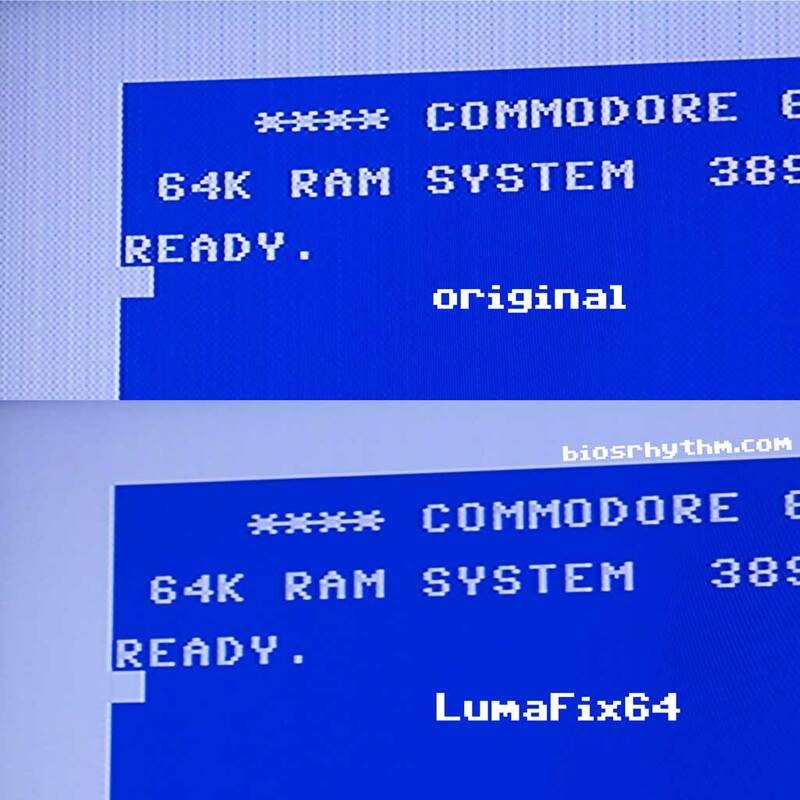 For each picture, there’s an original shot of the unmodified C64 and one with the same C64 with a LumaFix64 installed. The C64 is connected to a Dell LCD widescreen display via a s-video lead. I used the three trimpots on the LumaFix64 PCB and dialed in each one according to the directions until the picture was as clean as possible. Below are the before and after pictures. Click each image to embiggen. What do you think? 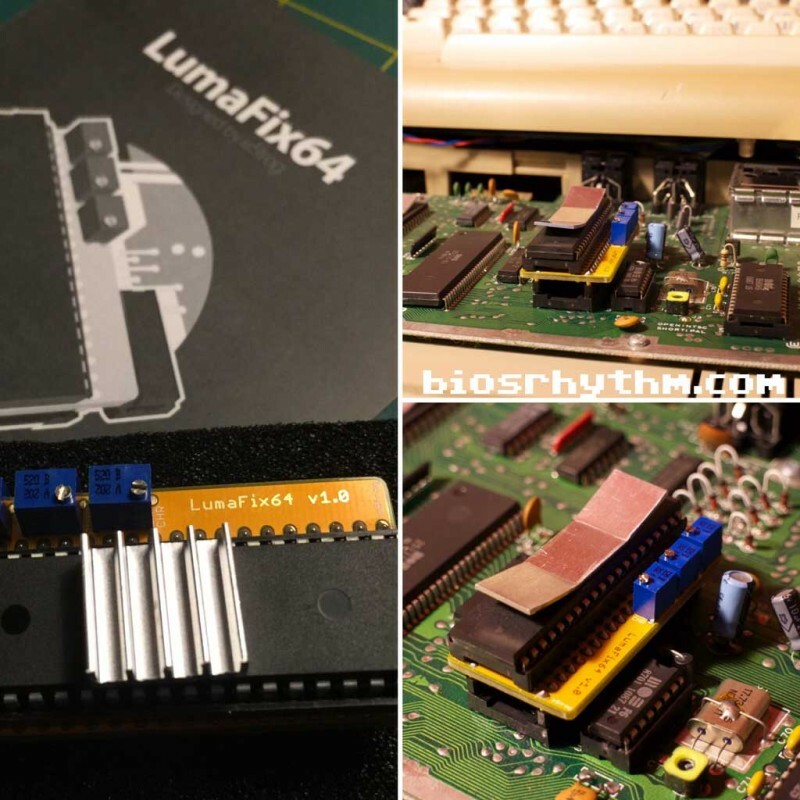 Will you be purchasing a LumaFix64 for your C64? Or will you be sticking with your stripes for more authenticity? Let me know in the comments. But loved those incorrect interpretations along the way to the display in front of me – for all of my life. And now i ask you: Where have all the jaggies gone? I purchased an S-video cable and plugged it into my multinational flat-panel LCD, thinking I would get crystal clear picture, doubly so because of 1. S-video and 2. a 21st century TV. The picture was even worse than the crappy picture we had to endure in the ’80’s! 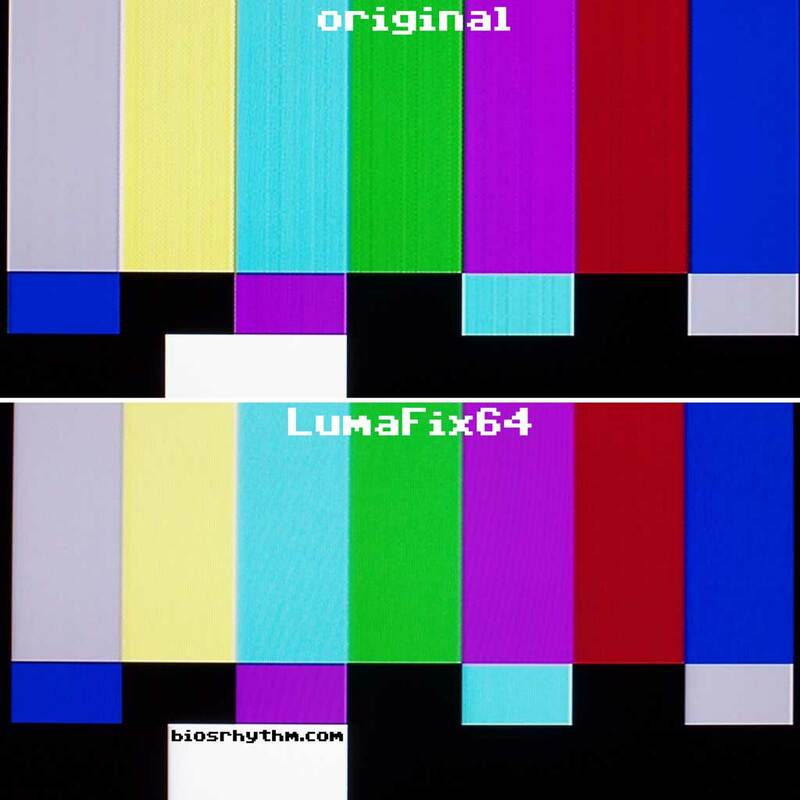 So “LumaFix64” or bust. What is it with the computers from the ’80’s and crappy display? I’d love to purchase a LumaFix64 but will have to wait until funds allow it. Blame lax standards of the 70s and 80s, video games and computers were able to get away with slightly off standard spec. Also the S-Video of C64 is not true S-Video, very close that most analog TV works fine. Digital TV are more picky about standards and may refuse to work with non-standard signal. My LCD TV doesn’t work with 2600, either from RF or composite mod, it displays only every other lines. Does it work on C128/C128D too? The pins are just different, but I think a version of this could be done. Wait, so it does not presently work on a C= 128D? 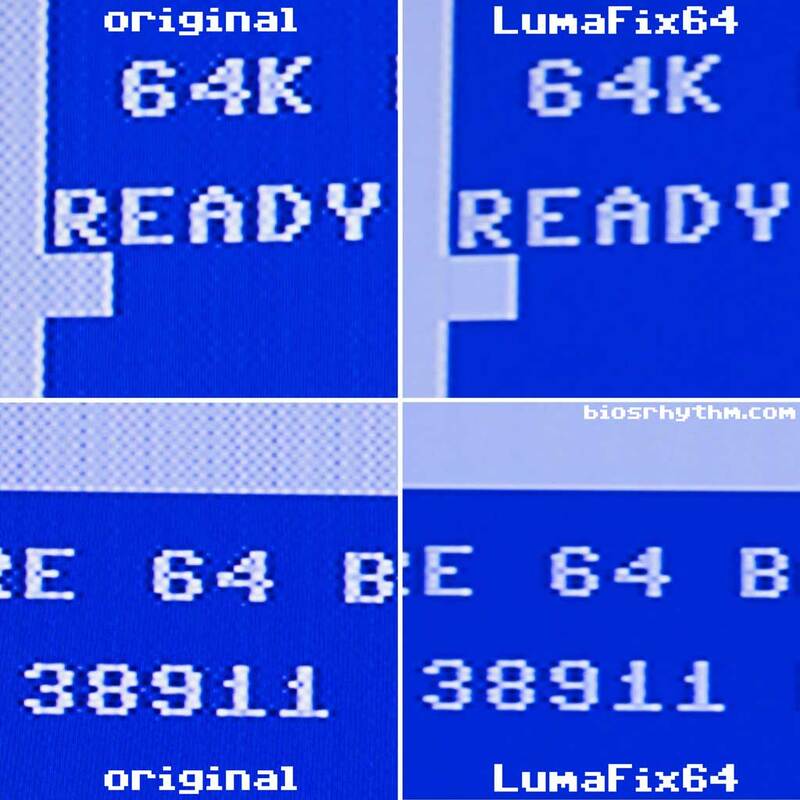 No “LumaFix64” for me then. Nice to see a review, problem with the checkered pattern seen above is mostly because of the modern TV used and the s-video incompatible voltage level of the chroma signal. 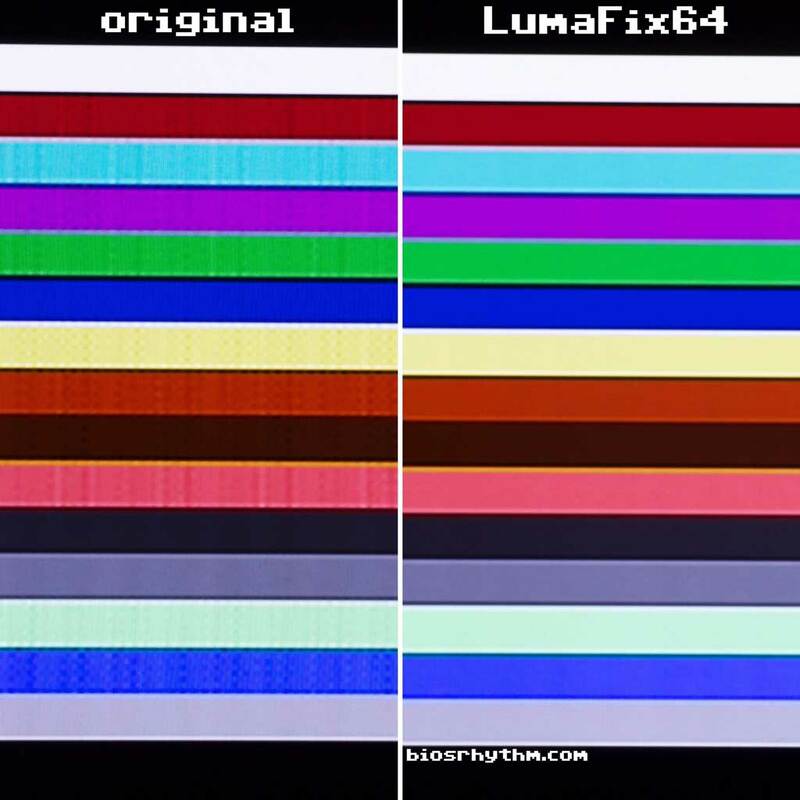 CRT TV:s are usually better on handling that, LumaFix64 just reduces the voltage level in the same way that some cables come with a fixed resistor – unfortunately a fixed resistor is not a solution that works everywhere depending on correct impedance in connectors etc. The bigger the TV the more visible these little problems are, a 1084 monitor may just show some lines – that have always been there… some computers seem to have emulator-perfect image already. Don’t mind the lines myself but when it was discussed I remembered seeing a solution on forum64.de and designed this in-between card as an easy solution. To just get rid of the vertical lines it’s enough with an inverter chip, capacitor and a potentiometer hooked with a few wires in the motherboard. It’s usually the AEC causing the problems, PHI0 may help a little. What if I have stripes that are really bad? I have horizontal slightly colored stripes that looks very nasty. Also I see some constantly waving wide horizontal “stripe” that looks like a bad sync to my monitor. I guess that even if I’ll get some really good upscaler for my monitor (now I have one of the cheapest) then the problem will not gone. I’ve tested the same upscaler (a little “VGA box” with S-video and Composite inputs) with Dingoo A320. No nasty h. stripes! The image is blurry, some jitter occurs but my eyes are calm at least. Dingoo A320 outputs 320×240 which I believe is the same 240p video like it comes from C64. I’ll try another upscaler but I guess it’s a problem with the cable… or possibly with my C64.